Our Mission: Girl Scouting builds girls of courage, confidence, and character, who make the world a better place. 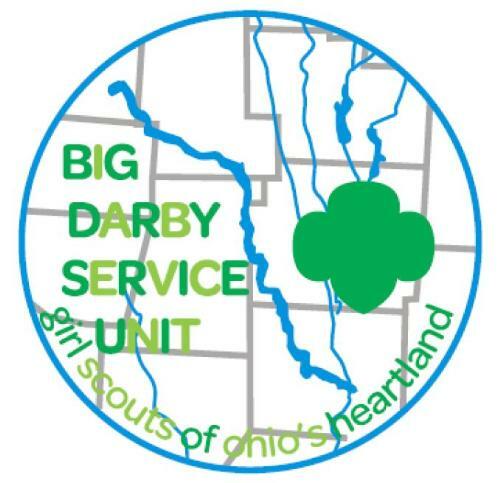 Big Darby Service Unit is dedicated to providing Girl Scouting to girls who live or attend schools in (most of the) Southwestern City School district boundaries. (Grove City, Galloway, and Columbus, OH). We have Girl Scout Troops in grades K through 12 and are seeking new girl members and adult volunteers for all age-levels. Girl Scouts of Big Darby Service Unit are also supported through the professional staff at our local Girl Scout Center. Girl Scouts of Ohio's Heartland serves 30 counties. We are dedicated to encouraging all girls to reach their fullest potential in keeping with the values and ideals of the Girl Scout Promise and Law.